We're continuing along with a busy winter season here at SHIFT-IT Coach, Inc. Having lots of fun with the SHIFT-IT Online Group as we navigate our way through the 17 maps of my SHIFT-IT System®. 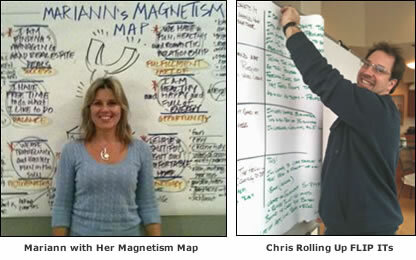 We are on the 'Focus On the Future' stage of the process ... where participants create their "Magnetism Maps" (visual tool for defining your personal vision and specific goals) and begin to define and flip their resistance (negative or interfering beliefs) that stand in the way of them having what it is they say they want. Below is a picture of my good friend, Mariann ... with her wall-size Magnetism Map (after an in-person visioning and alignment session). And other one of my new assistant Chris, as he rolls up some 'FLIP-IT' work we did on some internal issues we were encountering in the business last week. Getting this stuff out onto paper (whether small or large) really goes a long way towards making desires and resistance conscious and SHIFTing IT to a better place! I'm also continuing research and writing of my 'Orphan Rescue' product that I mentioned last week. A visual way to identify and work with old issues that are interfering in your adult, present now. This week's article is a quick tips sheet on Orphan Rescue ... try it yourself or drop-in for assistance during SHIFT-IT Central® on Mondays nights. 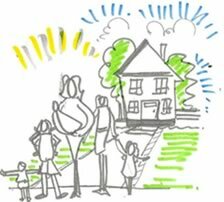 "My boss and I traveled to Canada for Interactive-Graphics instruction with the generous Christina Merkley – to investigate the craft of Graphic Recording and Graphic Facilitation. I went from knowing nothing ... to confidence in producing meeting murals that were very well received in our busy organization. I incorporated my new skills immediately into my organizational development work – creating visuals for our Manager's Forum, a communications roll-out and departmental visioning sessions. I drafted a character – "The PEMCO Guy" which made it fun. And people loved it! Our visual "PEMCO Story" created a 'buzz' with people dialoging, strategizing, and focusing on accomplishments (was an interactive-tool rather than just painted picture in the room). Was fascinating to be party to a whole new communication method with positive energy and results. Interactive-Graphics is delightful, gets the job done, is effective, and entertaining ... all at the same time! I'm with Christina when she says that 'everyone can do this'." Full Details and Online Registration ***Early Bird on Now, Just 9 Spots Left! Do you ever get overly emotionally triggered by things in your life? Do you seem to react more than is necessary? Is old baggage preventing you from creating what you really want in your life now? 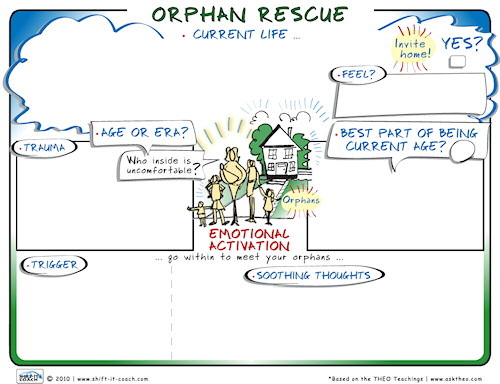 If so, my latest visual map, called "Orphan Rescue", is an integration tool that unlocks the mystery as to why you react the way you do and how to SHIFT-IT --- so you can create the life that you really want. In my last issue, I wrote about the natural developmental delays that coaching clients can sometimes encounter, that can cause problems in their being able to create what they want in life. The developmental delays can occur in the areas of attachment, identity, competence, confidence, connection and the like - causing clients to have problems in manifesting their relationships, careers/businesses, abundance, fitness/body etc. My SHIFT-IT System® naturally addresses many of these blocks and delays. However I am always on the lookout for new methods to assist my clients (and myself!) so we can manifest what we really want. For years, I've been doing different kinds of inner rescue work (in addition to being a coach, I'm a trained Alchemical Hypnotherapist). So creating a visual tool to more effectively assist in this inner work is just a natural extension of my practice. This work is still in preliminary draft stage (yes, there are discrepancies between the map and the directions) however I have found that releasing early drafts of my tools to my e-zine and social media audience helps all of us. It helps you with inner work, and it helps me by getting your feedback and comments. So, in the spirit of new product development, here is a Version 1.0 prototype to play with. Please respect my copyright on this material. It is for your personal use only. If you are a coach, therapist or other helping professional, you may not use these materials with your own clientele. 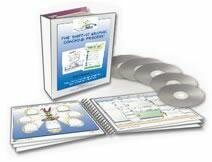 For proper training and certification in my visual way of working, please see Graphic Coach Certification. The Orphan Rescue exercise is an additional 'SHIFT-IT' exercise ... that fits into the Trouble at the Border stage of the SHIFT-IT Graphic Coaching Process®. It is to be used when you notice yourself becoming 'overly activated' about something in your life, which is a sign that something beyond just your current situation is going on. This 'something' usually has to do with an earlier episode, incident or situation in your life. Usually something of a negative or upsetting dynamic (or trauma) that has a similar feel to what has just happened in your life (in Law of Attraction speak ... something of a similar frequency or vibration). This map (and its accompanying directions) assists you to identify this earlier dynamic in your life and to finally SHIFT-IT (to get relief in your present life). The earlier dynamic is usually connected to a memory that a younger part of you holds. This younger part of you is called an "orphan". This younger part of you has inadvertently been abandoned (by you or others in your life) and needs to be rescued --- so it is no longer activated by things that occur in your adult life. This is a 'soul integration' or 'soul retrieval' process --- that enables you to reclaim your power and put your functional, adult self in charge of your life. Create a quiet space for yourself where you aren't likely to be disturbed. Set aside at least 20 minutes to complete. Go Within And Ask 'Who Inside Is Uncomfortable?'. We do Orphan Rescue work when we notice that something in our current life really bothers us --- i.e. when we are 'emotionally activated' by something, perhaps having a reaction that is above and beyond what would be natural or normal for the situation. Pay attention to the things that spike you emotionally (in a negative way). Make a note of them and when you are able, sit down and complete an Orphan Rescue map to create a 'shift'. 3. Go Within And Ask 'Who Inside Is Uncomfortable?'. Take a few moments to center and calm yourself by taking a few deep breaths. 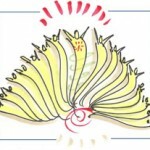 Then, in your mind's eye, summon up the present situation that has been emotionally activated. For example, perhaps you overly reacted to something you heard on television or uttered by a friend, colleague or family member. Or, you suffered an uncomfortable interaction of some sort. Or a rejection, judgment or some such thing. Bring the memory of this recent incident to your mind. When you have identified the region of your body that had the reaction ... focus your attention on it and ask ... "who inside is uncomfortable?" (thank you and acknowledgments to the soul integration work of friend, colleague and mentor Sheila Gillette via the Teachings of THEO for this insightful question). Ask this question (you may need to ask it a few times) and wait for a response. 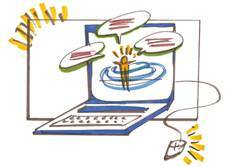 Your response may come in the form of a visual flash, a feeling, or a sense. Usually it is connected to an earlier time in your life. Allow any information to come through and accept it (do not censor). Ask yourself 'how old am I'? 'What am I remembering?'. Some scene or memory from your past will reveal itself to you. Just relax and let it come out. When the memory starts to come into focus, write the specifics of it down. How old were you and what was happening to you at that time? This memory will have the same feel (frequency or vibration) as the current life situation that originally triggered you and brought you to your Orphan Rescue work. If the memory is particularly traumatic, be sure to keep yourself 'out of the memory'; just looking at it and observing it from a safe, high distance. Record what happened and how the younger part of you was impacted. This is the orphan that this particular incident in your current life is connected to. There is unfinished work for you to attend to. Multi-dimensional Note: occasionally you may ask these questions and encounter something that is not logically yourself but some other aspect of consciousness. You may encounter a group or collective memory (shared by many people), or a memory from a time far beyond your present lifetime (i.e., in some terminology this would be considered a past life). Go with it (do not be afraid or concerned ... sometimes our consciousness works in mysterious ways). Just write down whatever story and explanation comes to mind. It is coming to you for a reason, so trust it and proceed according to the next instructions. Next, freeze-frame the scene that your orphan is in. Literally imagine all of the action being frozen and your orphan being left in the middle of it --- kind of blinking their eyes and wondering what happened to make everything around them freeze. Next, allow your current, adult self to materialize in front of this orphan (like the 'transporter' teleportation device in a Star Trek episode). Your orphan may find this a little unusual (as it's not everyday that your scene freezes around you and your Future Self materializes in front of you!). But gently introduce yourself to your orphan and explain who you are and what you are doing there (i.e." I am your Future Self ... I'm you at the age of ____, and I'm here to help you, you no longer have to suffer through this situation alone"). Proceed to nurturing your orphan. You have interrupted them in the middle of an unpleasant, perhaps even traumatic situation. Bring your adult conscious to this situation, as you would to any little child (or adolescent or adult) in distress. Soothe them. Say comforting things that you know to be true from your adult perspective (to evoke your adult consciousness, go back to your answers about 'what is the best thing about being your current age'). Bring comfort to your little orphan by reassuring, soothing and explaining things to them (in age appropriate language and concepts). If you are a parent in your adult life, treat this orphan as you would one of your own precious little children when they were at the same age as your orphan (or, think of children you know of the same age and act accordingly). Intrigued by Orphan Rescue? Having a tough time doing it on your own. While self-coaching yourself via my maps and instructions is helpful, it sometimes helps to have me personally coach you through your Orphan Rescue work. I have a drop-in coaching community every Monday evening at 5pm pacific called SHIFT-IT Central®, where we often do Orphan Rescue work. Swing on by for some direct assistance from me. 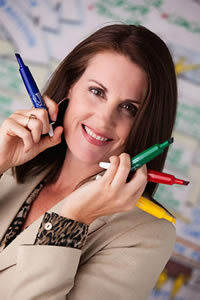 The material I have shared with you today is the preliminary start of a new self-coaching product. Over the course of the next weeks and months I will refine the map and instructions and add audio examples (of me coaching clients through their Orphan Rescue work) and hopefully a guest audio with Sheila Gillette and THEO on their Soul Integration and energy shift perspective. If you are interested in being a volunteer, requiring an audio recording of your Orphan Rescue session, please contact my assistant Chris Miller at [email protected] to express your interest to be added to my volunteer list.